!These Vent Atmospherically! Meaning Water Will Leak From The Vent Port! Some leak more than others. Installers must use Fitting and Tubing of choice to run a drain line or drain saddle. This will satisfy the bureaucrat that is preventing you from making a beverage. Failure to read and follow installation instructions, is a failure! All materials in contact with the potable water are in compliance with the requirements of the Safe Drinking Water Act, Public Law 93-523, National Interim Primary Drinking Water Regulations. 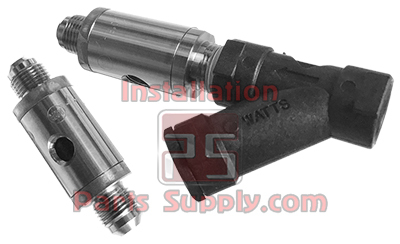 Watts Series SD3 is a dual check with atmospheric port designed for the protection of the water supply from carbon dioxide gas and carbonated water. These substances can flow from post-mix beverage systems and are very acidic. If acidic water meets copper pipe, it causes the leaching of copper salts into the water supply and if ingested, can cause nausea, abdominal pain, vomiting. The SD3 prevents the reverse flow of potentially contaminated water into the potable water supply. The SD3 atmospheric vent provides a visual indication of failure in the event that the downstream check fails and system back-pressure exceeds the supply pressure. Watts SD3 is recommended for use on Post-Mix Carbonated Beverage Equipment and equipment for tea and coffee. Installation Instruction Before installing, flush out pipe lines to remove scale and other foreign matter. The valve can be installed horizontally or vertically (flow up or down). Install the valve in the line with the arrow on the valve body pointing in the direction of flow. Connect a vent discharge line to the vent outlet of the SD3 and vent to a safe place of disposal with adequate ventilation. The valve should be installed such that the strainer and the valve are accessible for service and maintenance.